Be it a hot summer day or cold freezing winter Armenia always has something to offer. Tsaghkadzor that is mostly known as a resort town, can be a real treat if you are into skiing. The town is in a mild climate, nice enough to stay in for a cup of warm tea and cold enough to get the best skiing experience. So, what should you try, when in Tsaghkadzor? In the beautiful slopes of Mountain Teghenis, with an altitude of approximately 1800m, Tsaghkadzor Ski Resort is one of the most popular places to go skiing in Armenia. When you ski down the mountain, the view is breathtaking - surrounded by nature, covered in all white, you will probably envy your own eyes with what you will see around! The location of the resort is very convenient - it is only 70 km from Zvartnots International Airport, hence, also very close to the capital city. The highest skiing point is in an altitude of around 2800 meters, which shows an amazing view Lake Sevan and Mountain Ararat. The resort also conducts lessons for professionals, so if you are seriously interested in skiing, you might meet a lot of skiers from around the world, and improve your own skills with a help of master coaches. If you are someone that does not enjoy skiing that much, don’t worry - there are other treats Tsaghkadzor has to offer. Try Tsaghkadzor ropeway, and enjoy the beautiful scenery of the hills and mountains covered in snow all around. On a nice sunny winter day, if you start from the top skiing point the speed chairlift will take you around 30 minutes and you can see Mountain Ararat, crystal clear. The ropeway is open every day and also acts as a starting point for skiers. There are 5 different routes - designed for both skiers and non-skiers. The ropeway is modern, safe and well-constructed. Skis, snowboards, eyeglasses and helmets are also available for rent. There is more to Tsaghkadzor than active rest. If you are interested in exploring other sightseeings, check out the ancient Kecharis Monastery. Dating back to 11-12th century, Kecharis has been one of the staples for Tsaghkadzor, that should be added to your must-see places. The complex is visible through the skiing routes but visiting it in person is a totally different experience. Built very early on and acting also acting as an educational complex, the monastery has undergone renovation, ready to show its beauty to the world. Kecharis consists of three different churches, two chapels and a gavit. Each of the churches and chapels in the complex are carved differently and each represent different history. 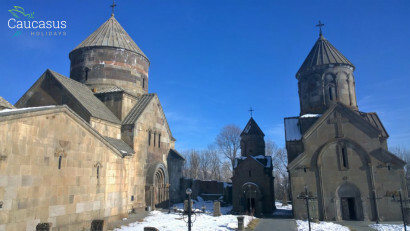 If you are in Armenia during the wintertime, do not miss out the chance to visit Tsaghkadzor - the real Armenian winter wonderland. To make your experience truly memorable, trust your visit to Caucasus Holidays!